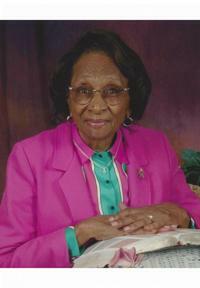 Obituary for Cladie Mae Hill-Wideman | Robinson & Son Mortuary, Inc.
Cladie Mae Hill-Wideman, 99, widow of Fred Leon Wideman, died on Friday, May 4, 2018 at her home. Born in Greenwood County, she was the daughter of the late Willie Hill and the late Matilda Hagans Hill. She was a member of Beulah Baptist Church where she served on the Usher Board, was a former Building Fund Treasurer, Sunday School Teacher, Senior Choir Member and Mother of the Church. She leaves to cherish her memories, one son, Freddie Amos Wideman; one daughter, Matilda Ann Wideman Mathis and son-in-law, Charles Mathis; six grandchildren; fifteen great-grandchildren; four great-great grandchildren; former daughter-in-law, Sandra Wideman and a host of other relatives and friends to mourn her passing.